If you are using an ATM for basic things such as withdrawing money, you can do it in English! There are a couple of other procedures you can do in English, though the majority of banking can only be done in Japanese. 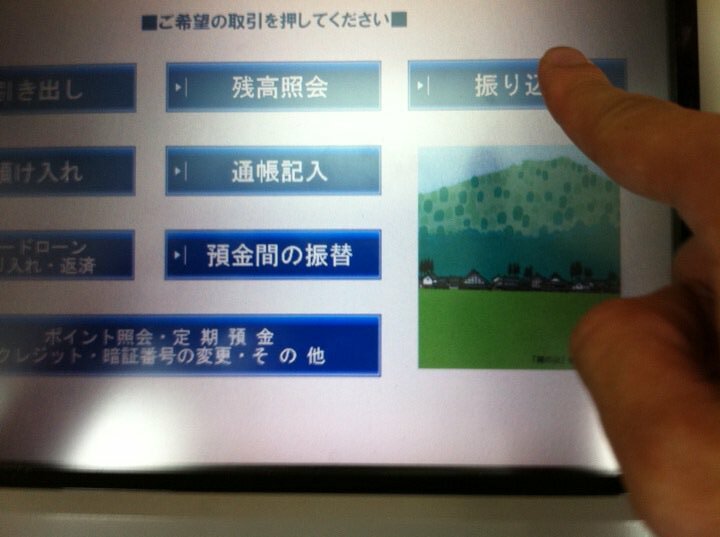 As for the Japanese-language ATM screen, this is roughly what it looks like at Hokuriku Bank ATMs. 2. Insert your cash card and bank book and enter your PIN. Press 確認 to confirm, or the red 訂正 button to go back a page if you make a mistake. 3. Enter the withdrawal amount (i.e. 10,000) and then press the 円 button. 4. 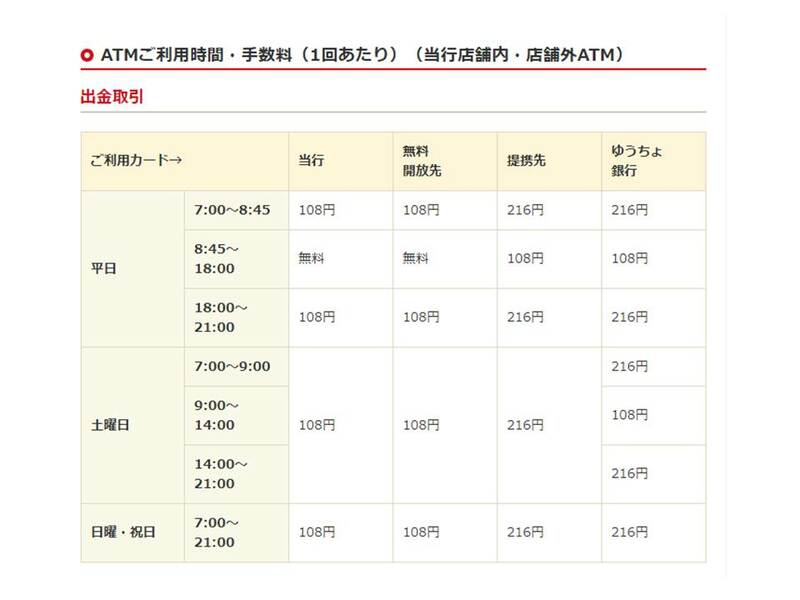 If it is a weekend or after 5pm, you will be charged 105 yen for the privilege of using an ATM outside of ‘business hours.’ If you are ok with accepting this charge, press the 確認 button. There is no way around this charge, other than backing out of the transaction entirely. 5. You will be shown you current account balance on top, and your balance after withdrawal below. If you want to proceed, press 確認. If you need to make changes, press 訂正. 6. You will be asked if you want a receipt. Press 必要 on the left if you do, and 不要 on the right if you don’t. 7. Take your money, card and bank book, and go to Disney Land. How to enter the withdrawal amount: You can either type in the exact amount, or take advantage of the larger unit keys to be sure you are withdrawing the correct amount. Press the 1 button, the ten thousand unit button 万 and the 円button in that order. Press the 1 button, the ten thousand unit button 万, the 5 button, the thousand unit button 千and the yen button 円 in that order. Press the 7 button, the thousand unit 千button and the yen button円 in that order. 3. Insert your cash card and put bankbook in slot. 4. The coin and bill doors will open. Insert money in appropriate slots (coins on the left, bills on the right; both are clearly marked). You can get rid of annoying small change this way, although there is a limit of roughly 100 coins. The slots will close once money is detected, but will reopen, so don’t worry that you weren’t fast enough if they close on you. 5. The machine then counts the money and displays the amount deposited. If this is correct then press the confirmation button 確認. Note: Press the red correction button (証) if you make a mistake while entering. 1. Press the bank book button 通帳記入. 2. Insert your cash card and bank book and wait while it makes little happy printing sounds. Why does this get its own section? It keeps a solid record of absolutely every transaction you make, and prints it automatically in nice little neat columns. It even turns the page for you if it fills one. You’ll have to decipher the Japanese, but it keeps a far better record than I ever could, and you know when automatic bills have been taken out. This can only be done from bank ATMs. These days most convenience stores have ATMs to withdraw some cash from your account. Though be warned that they will have business hours even if the conbini is open 24/7. Pretty much every conbini ATM has an English option, so you should be ok on your own. On the off chance it doesn’t, follow the guide for a Hokuriku ATM, which will be very similar. It is also worth remembering that some convenience stores now have a Hokuriku Bank ATM. Look for the red and white Hokuriku Bank sign outside the store. The ATMs have an English option on the display and you can withdraw money at one of these ATMs until 11pm (Monday to Saturday) and 9pm(Sundays and Public Holidays). Near the ATM there is usually a time schedule with the fees listed for using the ATM during specific time periods. There is a window of time, on weekdays between 8:45AM- 6:00PM when you can withdraw money at no additional cost. Withdrawing money at any other time (including all weekends and holidays) will cost a small amount. This chart from Hokuriku Bank’s website explains in more details, as the fees charged also vary depending on the time.